Hugo O. Hanft was born in 1871 in St. Peter, Minnesota to Oscar and Anna Hanft. Oscar was a tinmaker, and died when Hugo was only six years old. Young Hugo attended school in New Ulm. Graduating at age 16, he desired admission to the University of Minnesota Law School, but was too young. Instead he enrolled in the German-American Teachers’ Seminary (Miwaukee), and graduated from there in 1889. He then taught at the Peru, IL High School until 1894, where he served as principal his final year. He finally enrolled in the University of Minnesota Law School, and graduated in 1896. He was admitted to the Minnesota Bar that same year. Hanft served as assistant Ramsey County attorney in 1896 under Pierce Butler. The following year he went into private practice, and returned to the University of Minnesota to receive his masters in law degree. He left his practice in 1898 to serve as First Lieutenant in the Army during the Spanish-American War. Upon returning he married Laura Holly, and they had one child, Hugo Holly Hanft. He resumed private practice until his election to the Saint Paul Municipal Court in 1906. He served as a municipal judge until he was elected as a Ramsey County District Judge in 1914, where he served from 1915 to 1943. Judge Hanft also presided over the sensational 1917 case against Frank Dunn for the murder of his separated wife, which resulted in Dunn being found guilty and spending the rest of his life in prison. ( This story is captured in the popular book Murder has a Public Face: Crime and Punishment in the Speed Graphic Era, by Larry Millet.) 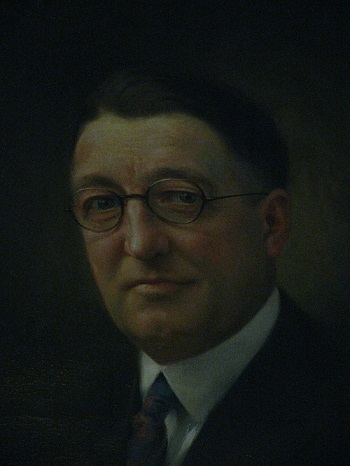 Hanft was also a candidate for Minnesota Supreme Court Justice in 1924. He finally retired from the Ramsey District Court bench in 1943. Hugo Hanft died in 1949, preceded by his wife, Laura, who died in 1931. As a judge, Hanft was very protective of youth, but was otherwise a “hands-off” guy as he understood the role of government. As a municipal judge he was concerned about the effects of alcohol, “penny parlors,” and dance halls on the young, as well as what he thought was lack of proper parental supervision. He thus inaugurated “compulsory economy” as a municipal judge, requiring young men charged with drunkenness to put portions of their income in savings, and to pay their parents for room and board. As a district judge he continued to protect youth with his long-term campaign against alcohol ”bootleggers.” Conversely, in 1928 he denied the right of state agencies to control the financial policies of the University of Minnesota. In 1934 he also struck down state income tax as unconstitutional, only to see it reinstated by the Minnesota Supreme Court in Reed v. Bjornson et al. (253 N.W. 102). The Law Librarian extends special thanks to the George Latimer Central Library. Their collection of historic newspaper clippings from the Pioneer Press and Saint Paul Dispatch were invaluable in locating the information presented here.